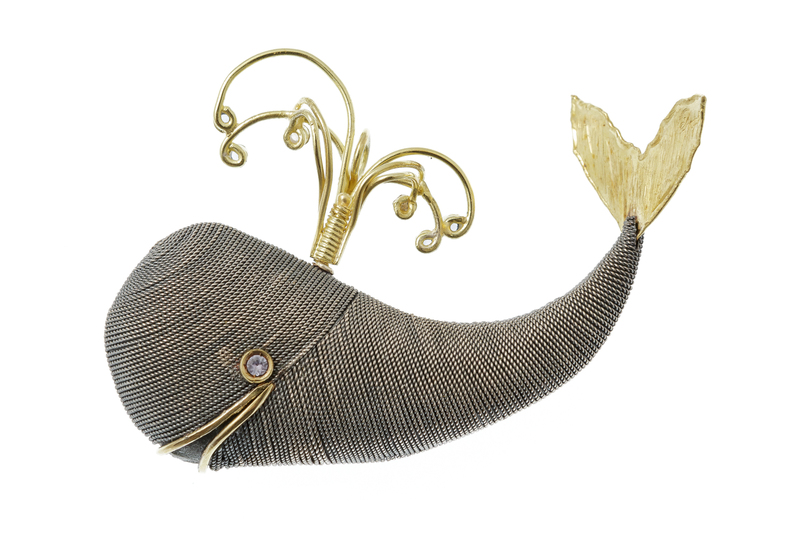 The figure of the whale is reproduced with fine descriptive synthesis in this elegant pendant in gold, burnished silver, sapphires and brilliants, realised with sophisticated and experimental filigree goldsmith technique that reinterprets the local goldsmith tradition in new forms. 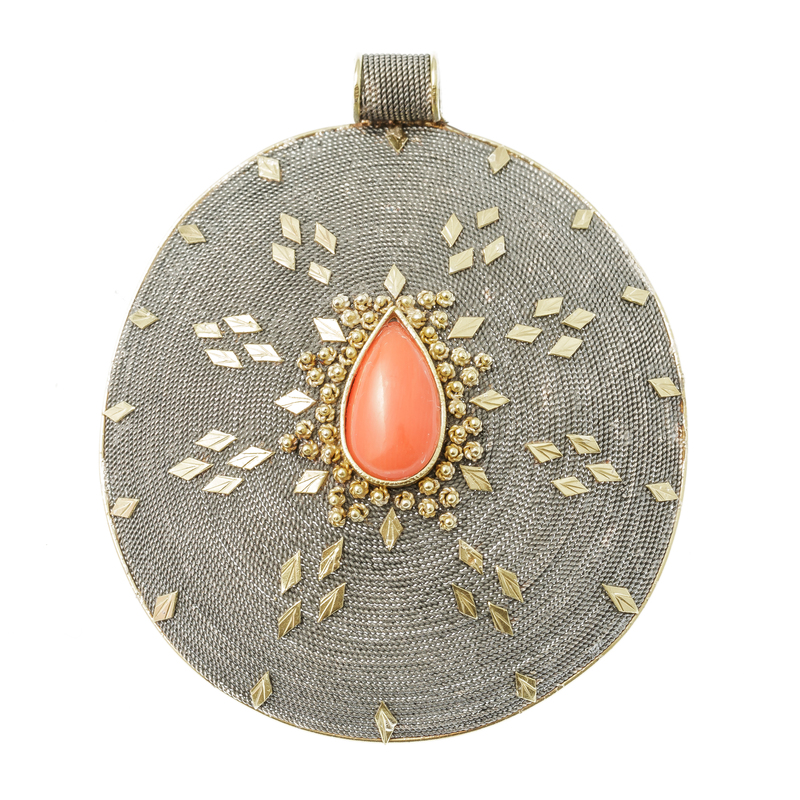 This prized pendant in silver, gold and coral is entirely realised in thin filigree thread with experimental technique that reinterprets the local goldsmith tradition, particularly inspired by the buttons of the traditional costume for women in the decorative composition and in the central bezel. 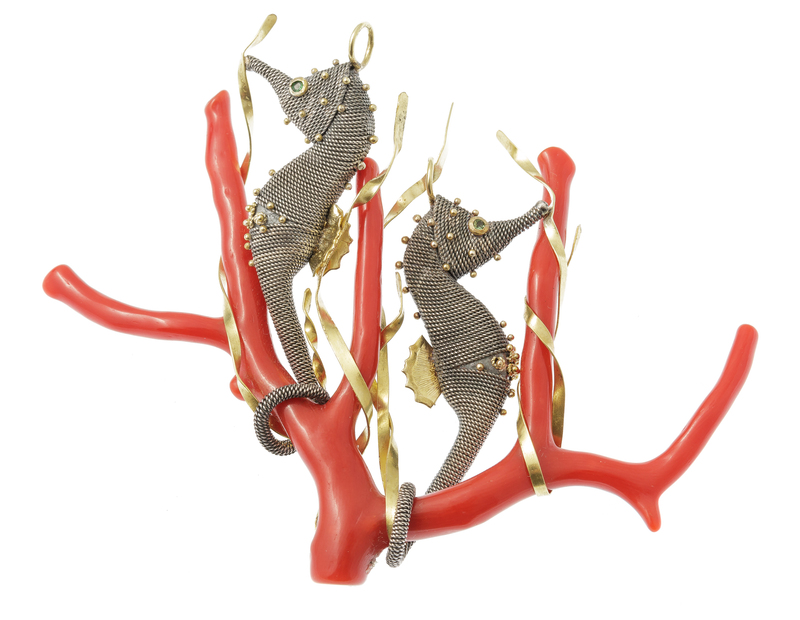 Refined seahorses in burnished silver are anchored in a dynamic position onto the coral branch of this prized pendant in a fluctuating composition among flimsy seaweed in gold plate. Giovanni Piga graduated at the Istituto d’Arte di Alghero. After gaining experience in the traditional goldsmith's techniques learnt in Valenza, in 1991 he started a small business in the city centre of Alghero, where he focuses on jewels of contemprary taste. His technical and aesthetic research focused on the reinterpretation of traditional goldsmith's techniques. He focused on filigree making, gaining experience at reknown Bosa filigree maker Giuseppe Bentivoglio's workshop. The result of this engagement was a sophisticated and original collection of artefacts, emphasizing the refinement of filigree, with playful and original design objects. 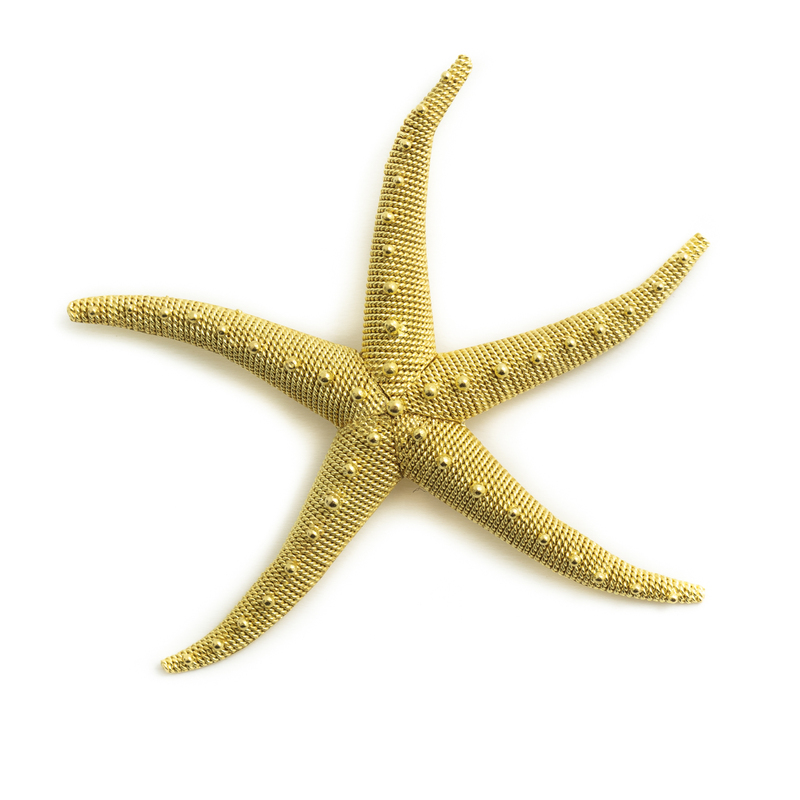 A personal perspective on the marine world characterizes this gold and silver filigree jewel collection. 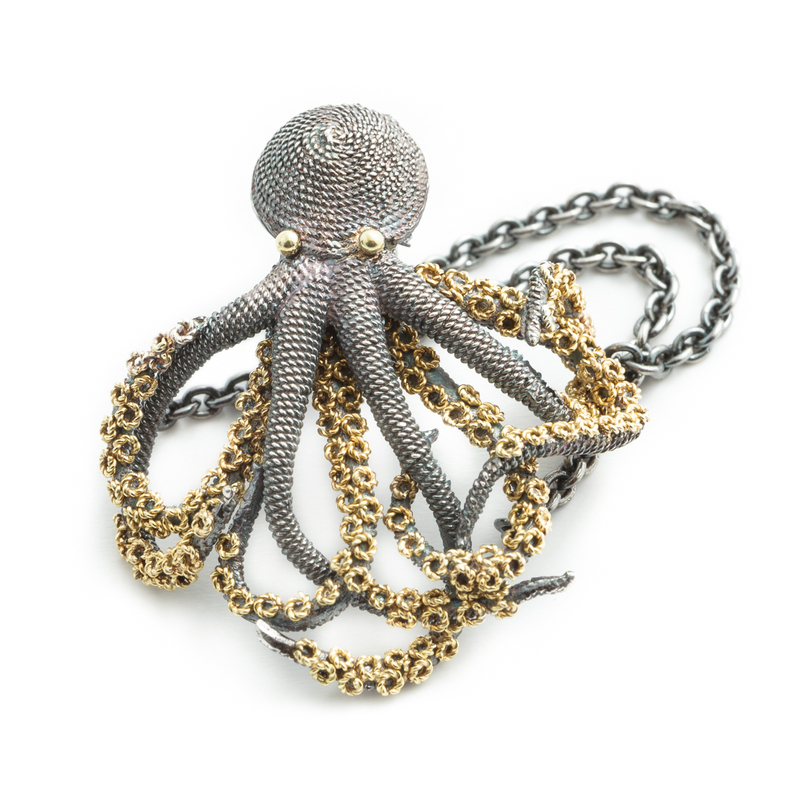 Imaginary jellyfish and sea stars, sinuous octopusses, surprising sea horses and urchins turn into precious jewels, thus becoming pendants, rings, bracelets and much more, with a sophisticated and modern taste, pulling together traditional knowledge and contemporary evocative intuitions. All pieces are hand-made following ancient goldsmith's techniques and traditional filigree making. The mountings of coral, precious and semi-precious stones are performed with skillful mastery, turning each jewel into a unique and original piece of art.